From I-95, take exit 80, MD-543 S (Riverside). Go 1.4 miles to US-40, turn right (north). 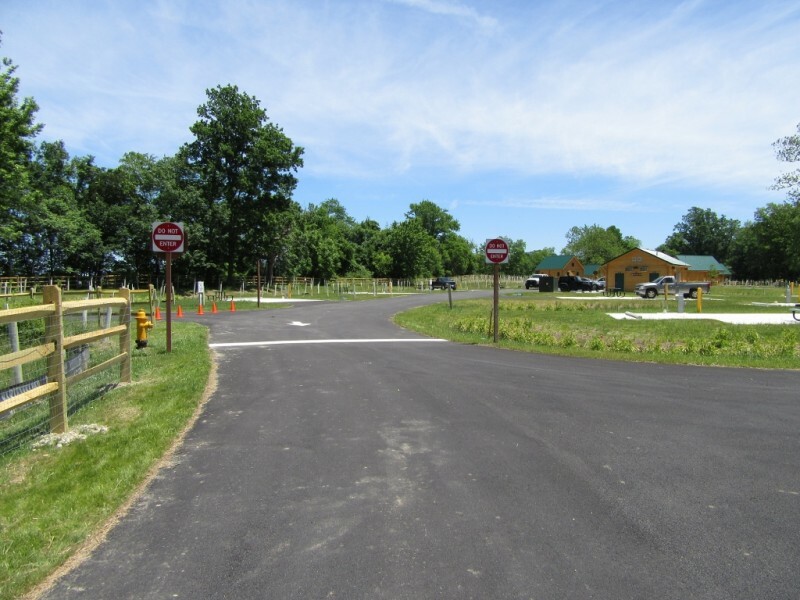 Go 2.9 miles, turn right on MD-715 to Main Gate (MD-715 becomes Maryland Blvd past Main Gate). Go 1.1 miles to Aberdeen Blvd. This is the sixth stop light counting the barrier stop light. 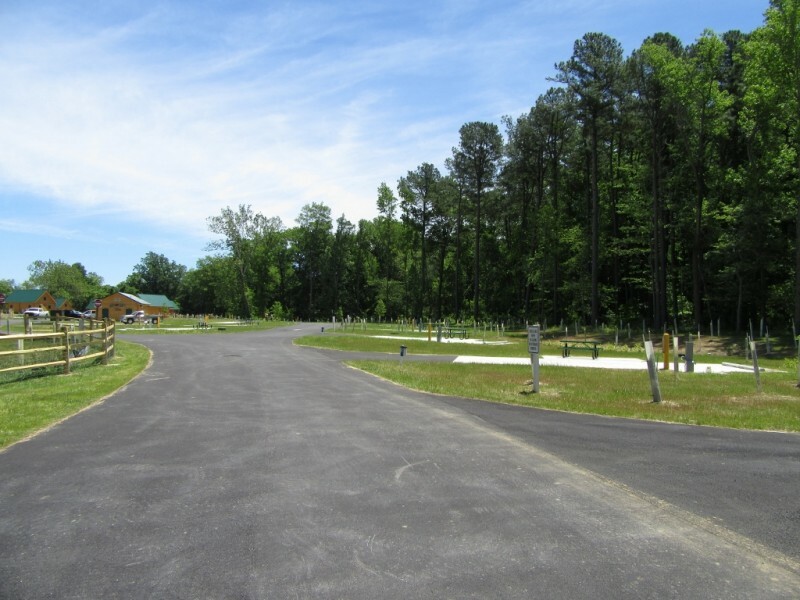 ---- For Shore Campground (24 sites): (Shore Campground is adjacent to the cemetery so you can follow the signs to the cemetery). turn RIGHT onto Aberdeen Blvd. Go 8/10th of a mile and turn left. This will be the first road after the third traffic signal. As of June 2016, there was no street sign. Go 1/10th of a mile and turn right (again no street sign). There is a Shore Campground sign. Proceed past the swimming for approximately 3/10th of a mile, Turn left at the stop sign. Shore Campground is immediately ahead of you. ---- For MWR bldg. : turn RIGHT onto Aberdeen Blvd. Go 8/10th of a mile and turn left. This will be the first road after the third traffic signal. MWR is approximately 2/10th of a mile on the right in a brick bldg. Accepted and highly recommended. Call (410) 278-4124/5789/2134/2135 for reservations. Reservations can be made 120 days in advance for Active Duty and 90 days in advance for all others. Not available in the campground. WiFi available at the library. 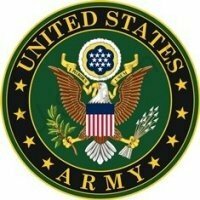 Prices are for "Active duty - Retired - APG Contractors - DOD Civilian". Patrons are allowed to sponsor up to 2 guests. Minimum weekend stay is 2 nights. IAW AR 215-1: Patrons are allowed to stay in one RV site 60 days in peak season (April 1- October 31) and 90 days in non-peak season (November 1- March 30). Cabins are 2 bedroom with a loft. Cabin prices vary on eligibility status and day of the week (Active duty on weekday is lowest, Guest on weekend is highest). 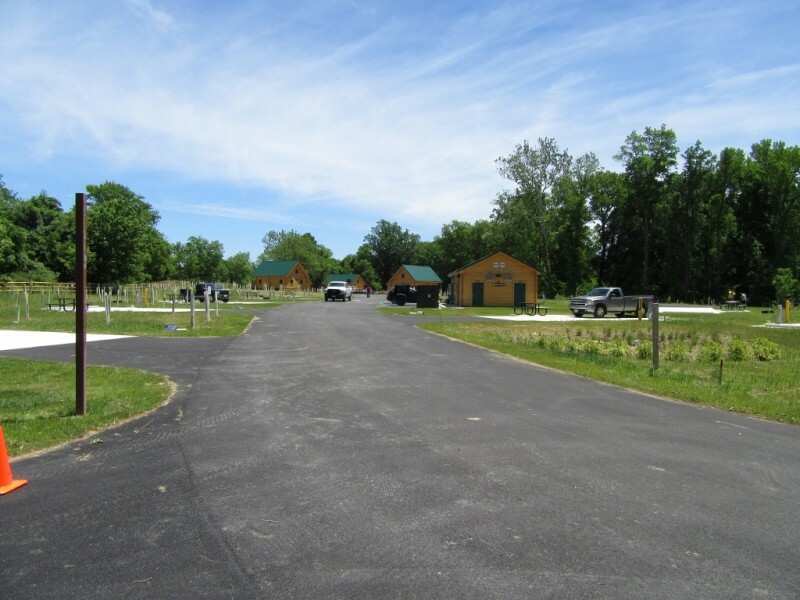 New campground opened June 2016. Located within within 2 hours of Baltimore, Washington DC and New York City by train. DO NOT CALL the 5789 number. Even though the voicemail message indicates it is MWR and you will be called back in 12 - 48 hours, it is not TRUE. Use the 4124 number. When I told the representative that I had left two messages on the 5789 number, she indicated she didn't know where that number went. Otherwise a good experience staying at Shore Park. We would definitely stay here again when in the area. 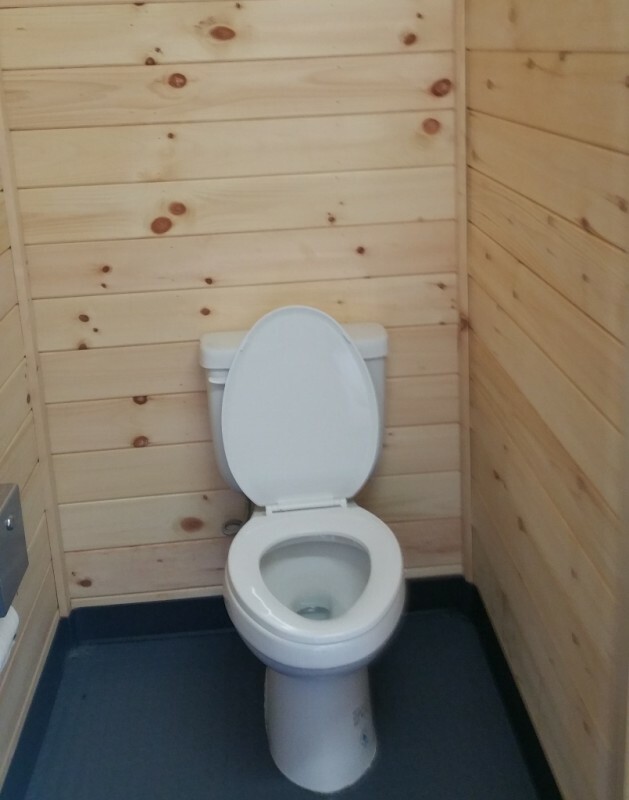 Site was level and roomy. We didn't spend much time at the park itself as we were visiting grandchildren who live in the area. This was our first time at a Fam Camp and we were impressed. The pads were concrete and level. Registration was easy, getting through to outdoor rec was a little harder. Be persistent in calling. There was an osprey nest at the entrance to the campground and a bald eagle flying around the backside of the campground during our stay. There was some construction going on near the entrance to the campground on one of the pools just outside of the campground. There are signs directing you to the campground, but one update is a couple of road names have been added. Aerospace Road is the left turn after the third traffic signal on Aberdeen Blvd. Then take the next right past swimming pool. Rate was $35 a day and check in and out was a breeze. We walked from campground to Outdoor Rec to pay for our stay. Can not tell you how nice the bath house and laundry facilities were. You will be given a code to both doors but need a pre paid laundry card to use the washers and dryers. As stated in another review the sewer height is high so make sure you are prepared. Also went to the Bombay homemade ice cream shop in Havre de Grace based off another review and it was great. They also have a candy store right across the street. 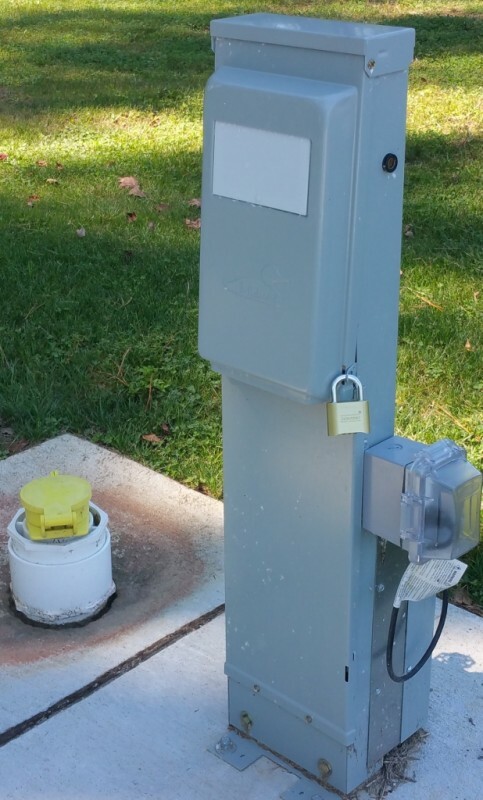 Check out was nothing more then leaving your parking pass, and laundry card if you get one, in the mailbox at your site and locking the electrical and sewer back up. Would recommend and will return. This is a beautiful campground located near the shore. It is a new facility with beautiful bathrooms and other amenities (as listed in the description) that are ample. The sites are level and quite roomy. The park itself is easy to find once you get your bearings. The base is quite large. I have given the park a five all-around. All of the paperwork was completed before our arrival and ready for our signature. Registration was easy. 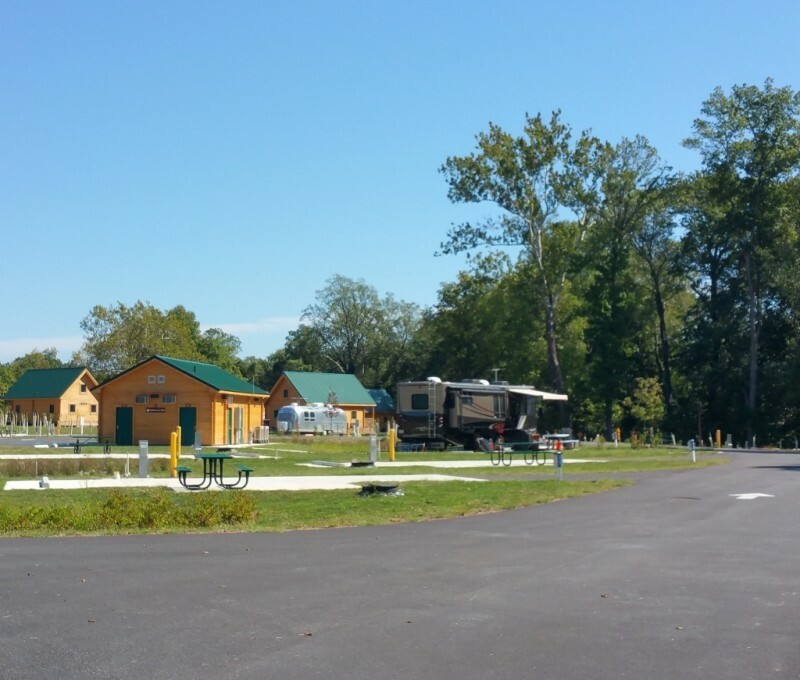 The campground is close to some great places to visit on the Maryland shore. The host was very nice and met us at the site once we got settled to confirm our military ID. There are some wonderful restaurants and shops at nearby Havre de Grace. There are also a number of museums to visit as well as taking nature walks to watch shore birds and other wildlife. 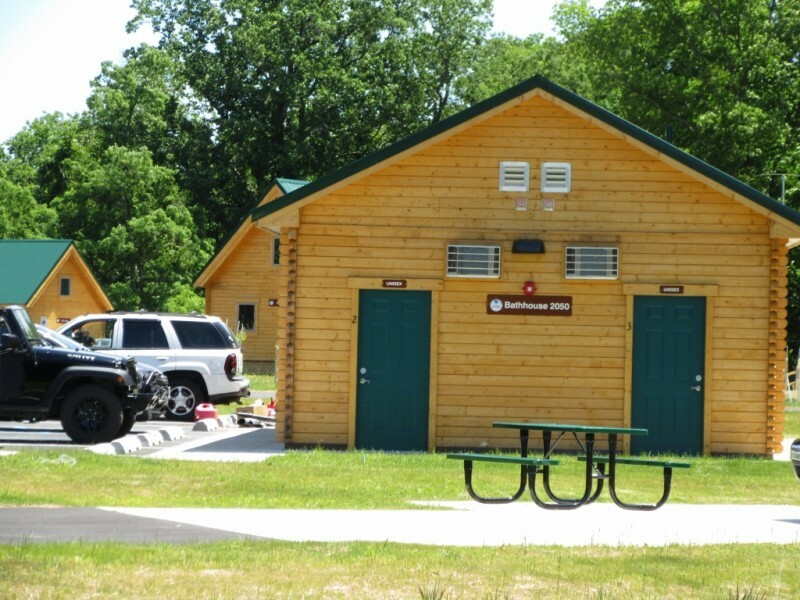 The campground is located at the Maryland Shore area by the mouth Susquehanna River. 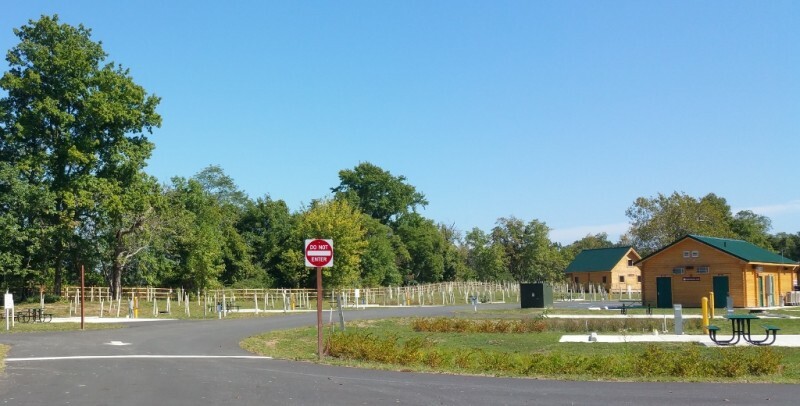 If you are looking for a beautiful, peaceful, roomy RV site in an area worthy of exploring, then this is the right place. I do not believe that $35/night for a site in this park is too much. We were only there one night as we were passing through on our way to Virginia. Next time, we will stay longer. 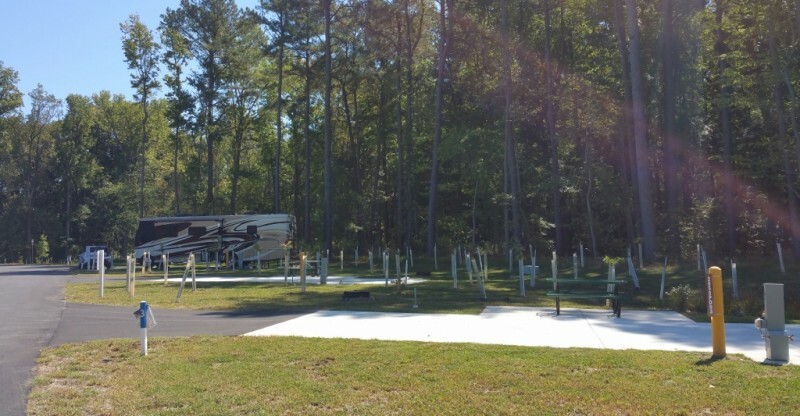 Hdcheckinfl’s review and pictures are an excellent description of the Aberdeen Shore Park RV Park. We might add that the lack of street lighting in the park curtails walking around the park during cooler hours after the sun goes down. The only lighting in the park is around the restrooms and laundry building which is pretty much located in the center of the park. The MWR staff at Outdoor Rec were very courteous and answered our questions. 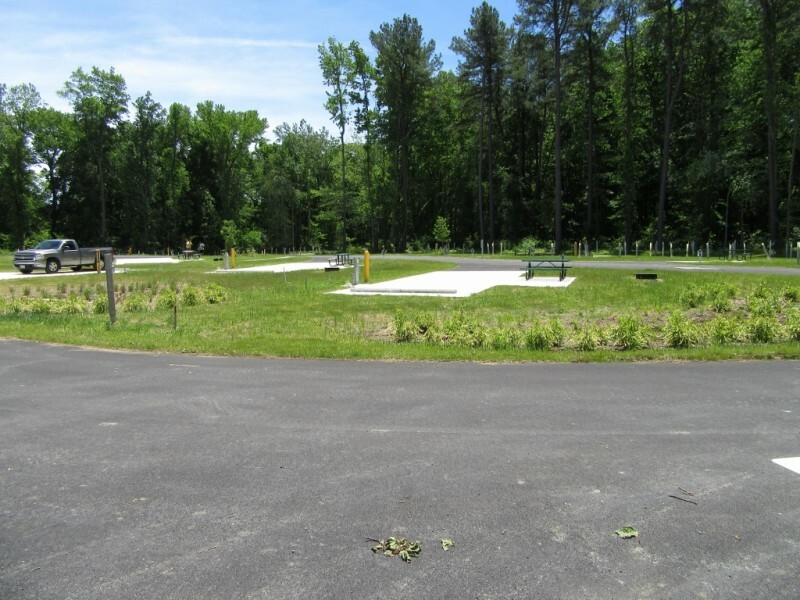 The park appears to be underutilized – we have seen no tenants in the cabins and only 7 to 10 RV’s occupying the sites daily. There are probably several reasons why the low occupancy rate. First may be the perceived impression that the Aberdeen location lacks things to do and places to visit. If that is the case then it is completely wrong. 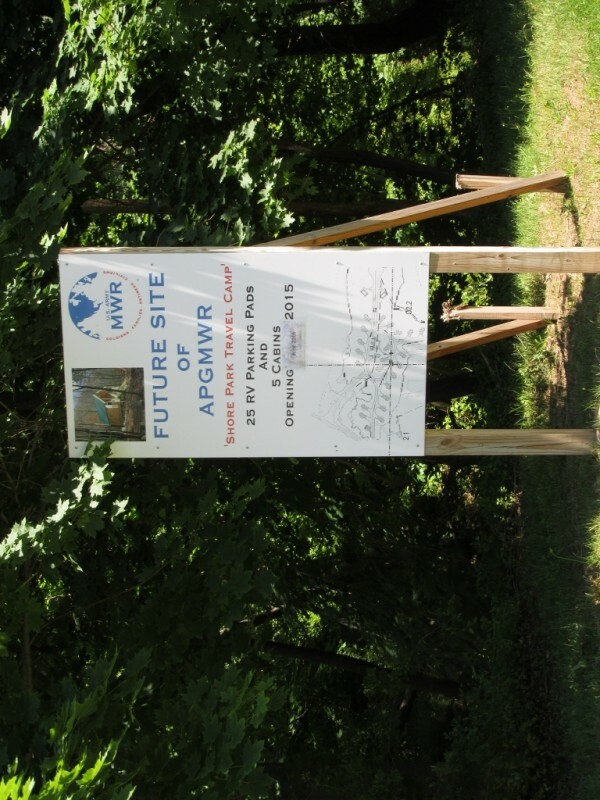 The APG/MWR offer quite a few activities on-base and special events off-base. Over the years, the near-by town of Havre de Grace has always attracted our attention - it is an interesting place to visit and a visit is never complete without a visit to a home-made ice cream parlor at 322 Market St. The second reason for the low occupancy could be the cost - $35 per day for a MCG may discourage vacationers and other travelers that are trying to get the biggest bang for the bucks within their vacation budgets. And finally, we have enjoyed our first stay at Shore Park and will return. We have been staying in the new Shore Park Travel Camp for the past 3 weeks. The cabins are not yet open. 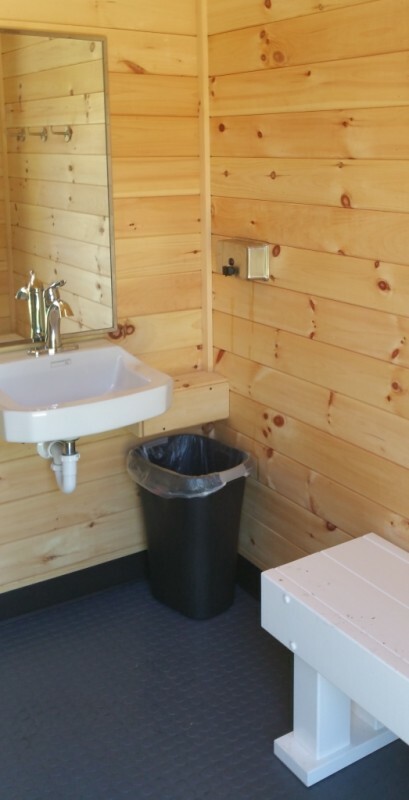 Since the facilities are brand new and there haven't been a lot of visitors (8 rigs including ours in 3 weeks) the bathhouse is in excellent condition save some bad starters on the lights. 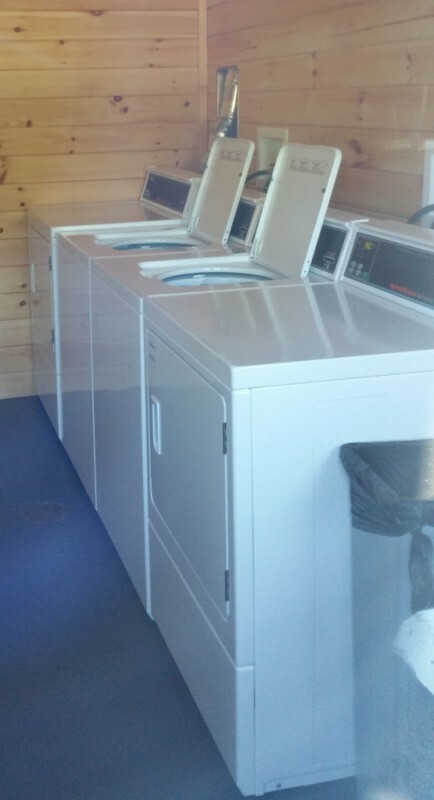 The laundry only has 2 washers and 2 dryers which could prove to be inadequate going forward. Sites are all concrete including a patio area. All are back-in and the layout could mean you are backing in on your "bad/blind" side depending on where you are. Most are pretty level (nothing like Cheatham Annex!) a few may be harder for a big rig. 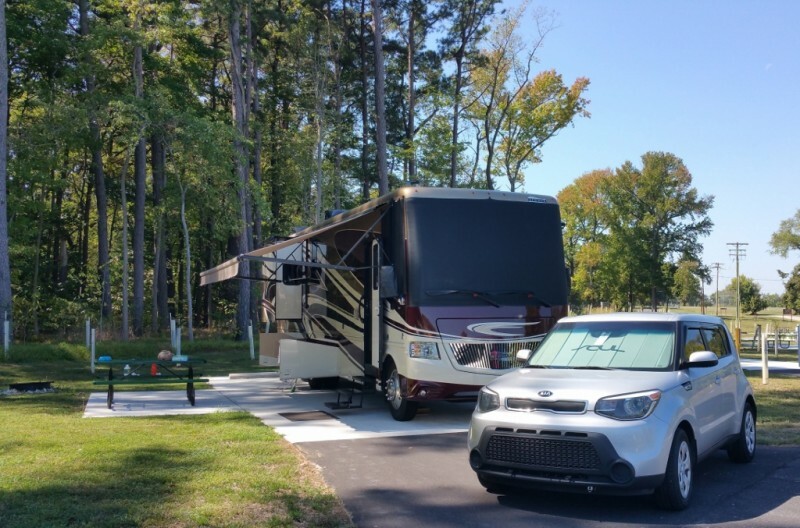 A small number of sites will only accommodate RVs up to 30'. Roads are blacktop helping to keep things cleaner. We were not able to get a signal on our site with our tripod mounted satellite dish at all due to the tall trees on one side of the park. Another Class A next to us moved to another site when they couldn't get a signal with their roof mounted dish. A large number of trees have been planted between and behind sites which may become an issue going forward. No service problems using our Verizon Jetpack or T-Mobile phone hotspot. Sewer hookup sits about 9" off the ground. Not an issue for our Valterra Sewer Solution but traditional hoses may need support. No electric issues, water pressure isn't wonderful.They do not want ANYTHING put on the grass areas without written permission. Picnic table, fire pit at each site. You will hear the gun testing - usually in the morning. Not deafening but it will vibrate your rig if they are using something big. We did not actually stay in the Shore Park Travel Camp. We stayed in the other campground on Aberdeen. We drove through the Shore Park Travel Camp the day it opened. It looks very nice and well laid out. 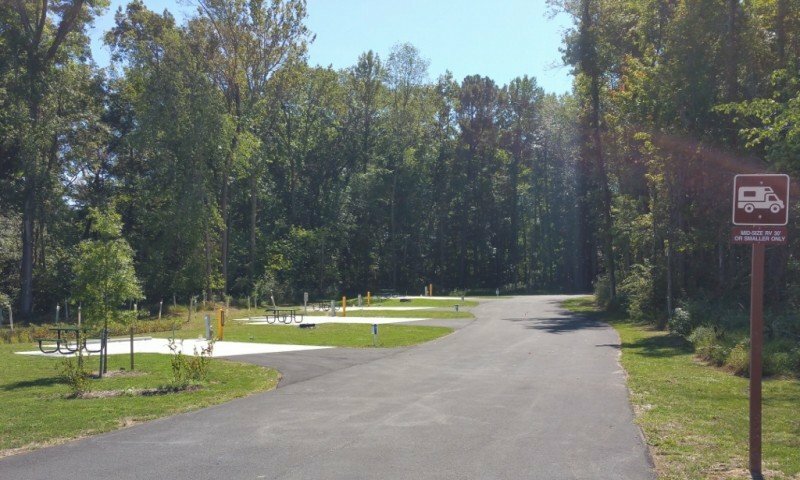 IF you are concerned about satellite reception, I would recommend Shore Park over the other campground on Aberdeen which has mature shade trees at each site. We intend to try Shore Park on our next visit to see the grandkids.